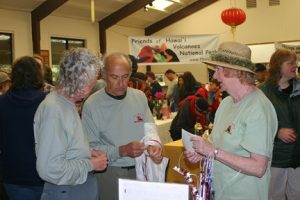 During the last federal fiscal year (October 1, 2010 to September 30, 2011), 123 Friends volunteers logged in over 2,600 hours. That’s the equivalent of 1.25 full-time, year-round staff. If you’d like to volunteer, please email volunteer@fhvnp.org with your skills and areas of interests – we’ll gladly find you a role with us! 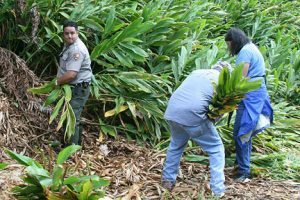 Friends of Hawai‘i Volcanoes National Park could not exist without its loyal cadre of volunteers, members, and all-volunteer board. 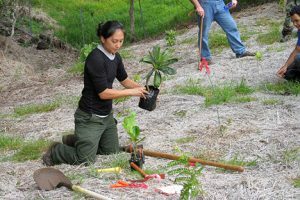 From active outdoor projects to sit-down office tasks, volunteer opportunities abound! The Volcano community holds a fun-filled July 4th Celebration every year at the Cooper Center, kicked off with a parade down Old Volcano Highway. 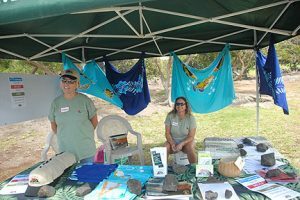 This family event includes our exciting silent auction of goods and services, which is a major annual fundraiser for the Friends of Hawai’i Volcanoes National Park. We need help at every stage: from soliciting donations and preparing bid sheets to set up on July 3rd and assisting with the event on July 4th. Let us know how we can include you!When: Saturday, July 4, 2015 from 9:00 a.m. to 11:30 a.m.
Every summer Hawai‘i Volcanoes National Park hosts their Annual Cultural Festival. Throughout the day, the sweet sounds of Hawaiian music fill the air and hula dancers, bedecked in flower lei and colorful costumes, bring meaning to the songs through the movement of their eyes, hands, and hips. Cultural practitioners lead demonstrations and provide hands-on learning opportunities for a wide variety of Hawaiian crafts, games, and foods. Stay tuned for information about the 2016 Cultural Festival.When: Saturday, July 9, 2016 from 10:00 a.m. to 3:00 p.m.